The plot: I can't really argue on this much, because everyone who read the novel agreed that the story itself is disturbing and dark, yet strangely captivating to the reader. Briefly, the human life in this novel is naught, more than naught, though the idea of being killed because you killed would seem fair. 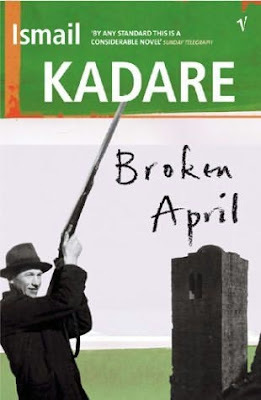 Vengeance, the bessa*, the Kanun**..all these are things Kadare knew pretty well how to use. The idea of vengeance itself wasn't new to me, nor to anyone I guess, but the extinction of families was! Gjorg: The protagonist: I guess the author likes to give life to loads of mysteriousness in his protagonists; the calmness, the serenity, yet the clarity of his case to be so. However, I wasn't drawn by his personality like the protagonists of other novels for Kadare. The characters of this novel seriously confused me! Diana, Bessian. Ali Binak..all of them had a fateful touch of mysteriousness. Language and Metaphors:The language was pretty simple and clear, I didn't have much difficulty, I remember I had more difficulty reading Chronicle in Stone than this one. No points raised on this. The metaphors are undoubtedly the thing I enjoyed the most in this novel. I enjoyed every description, even harsh ones, he put beauty in ugly things very poetically. I loved the description of April breaking and relinquishing the short life of Gjorg, the description of the old woman talking, how he described the dirt coming from her mouth, it was ugly yet beautiful. "We're entering the shadow-land. The place where the laws of death prevail over the laws of life"
"That fragments of sleep tried to fill in disorder, as a few stars try to people a dark autumn sky"
"It remained there, at his very center, a lost jewel in whose making all the light of the world had been consumed"
*The pledged word, faith, truth. Thinking of a clever comeback when it is too late. The phenomenon is usually accompanied by a feeling of regret at not having thought of it when it was most needed or suitable.